Telemark Place is one of the most convenient locations in Whistler, located right next to the Westin Hotel, and offering both its own ski-in trail right back to the complex and a 2-3 min walk to the lifts. Unit 25 has just completed a renovation to the highest standards in a modern idiom. The hallway features a grey slate floor with a striking scarlet bench for removing ski boots and a matching hall table. This area leads into the main living area where a large gourmet kitchen featuring custom-built cabinetry, granite countertops and a large island with stools. To the right hand side is the seating area around the fireplace which reaches up to the ceiling and has polished concrete tiles. 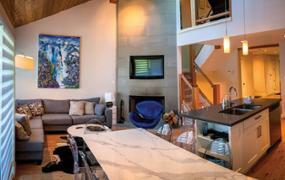 A 40 inch LCD TV is set into the fireplace surround above the wood-burning insert. The dining area is beyond the kitchen and offers a dining table with 2 extension leaves. Upstairs are 2 bedrooms: master with king bed, large closet area, LCD TV and ensuite bathroom and second bedroom with queen bed and separate access to the same bathroom. The upstairs also features a small open mezzanine area with 2-seat sofa (converts to twin sofabed) and additional wall-mounted LCD TV. This area also features an excellent electrically-operated massage chair - great for loosening up after a day on the moguls. Downstairs are 2 further bedrooms, each with king or 2 twin beds and a second full bathroom. Each downstairs bedroom also has its own wall-mounted LCD television. 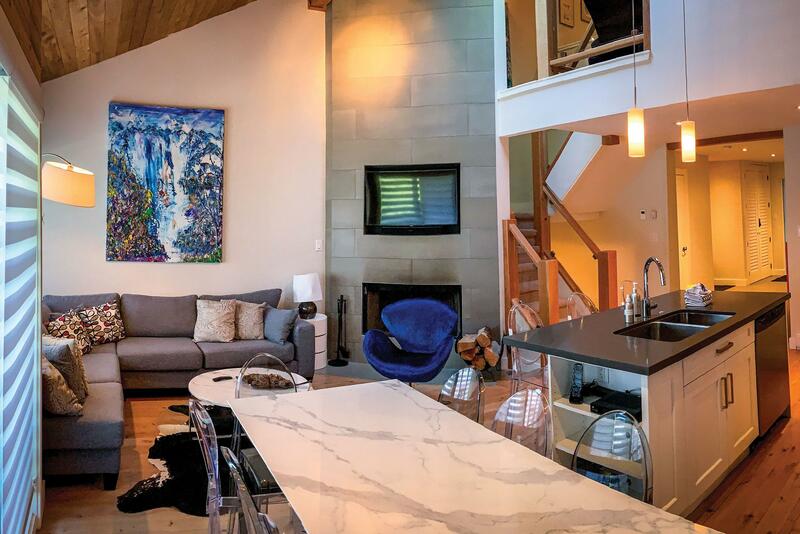 This home would be a great choice if you are looking for top quality ski-in ski-out Whistler accommodation within a 2-3 minute walk of the village. Please note that this home has a single car garage suitable for a car no larger than a medium-sized SUV. There is a very limited amount of visitor parking (space not guaranteed). Any additional or larger vehicles brought may have to us the pay parking in the Westin Hotel which is very nearby.